The Forbidden City, now called the Palace Museum (in Chinese: 故宫; Pinyin: Gùgōng), is a building located in central Beijing that used to serve as a palace for the Chinese Emperors of the Ming and Qing dynasties. In every version of Mario is Missing!, it is one of the landmarks that gets raided by Koopa Troopas. They steal the entire Gate of Heavenly Peace, causing the whole place to be shut down to the public until it is returned. 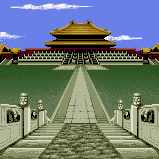 After Luigi takes back the Gate, brings it to the Forbidden City's information booth, and proves that the item in his possession is genuine through some questions (seen below), the Forbidden City becomes open once more. Who was forbidden from entering Forbidden City through the Heavenly Gateway? What is Forbidden City's present name? Who built the heavenly gate? The Gateway of Heavenly Peace, Tian An Men, was built in AD 1651. An impressive 110 feet tall, Heavenly Peace is the main entrance to Forbidden City, which has been renamed the Palace Museum. Once the walled estate of emperors, only the Emperor himself was permitted to use Tian An Men -- guards kept everyone else out. Those entitled to visit the City had to use a separate entry. In 1949, the leader, Mao Zedong stood at the Gate to announce the formation of the People's Republic of China, the present day Communist government. One of the question's answers references Kwai Chang Caine, the protagonist of the ABC television series, Kung Fu. This page was last edited on March 29, 2018, at 17:42.